Vitamin Water is another product by Glaceau, the maker of Smart Water. It is a privately owned subsidiary of The Coca Cola Company, which manufactures and distributes a variety of enhanced water products. Enhanced water is a drink marketed as water, but has additional ingredients. These ingredients can be natural or artificial flavors, sweeteners, vitamins, minerals, and other enhancements. The company was founded in May 1996 with the launch of Smart Water, which is an electrolyte enhanced water. Vitamin Water was introduced in 2000, just as when the company expanded to distribution of their products nationwide. Below are the latest Vitamin Water prices. By 2002, the enhanced water products of Glaceau became one of the top selling enhanced water brands in the United States. Vitamin Water was the best selling product among them. With the positive reception of the market, the company earned more than $300 million in revenues by 2006. In essence, Vitamin Water is a bottled water with added sweeteners, essential vitamins, and minerals. Because it has added flavor, it becomes more exciting than a regular bottled water. It becomes great tasting and nutrient enhanced while also serving as an excellent source of vitamins B and C.
Vitamin Water comes in two sizes, a 20 fluid ounce bottle and a 32 fluid ounce bottle. When it comes to the calorie content, most regular formulas contain about 120 calories in a 20 ounce bottle. This may not be a significantly large number, but you may want to reconsider in case you are planning on drinking up regularly. This only serves as a reminder just in case you have a goal of losing weight. The majority of the calories in a Vitamin Water bottle is from the sweeteners and added cane sugar. To give you an idea, a 20 ounce bottle has about 30 grams of added sugar. Most people who love Vitamin Water is into it because of the said nutritional benefits. 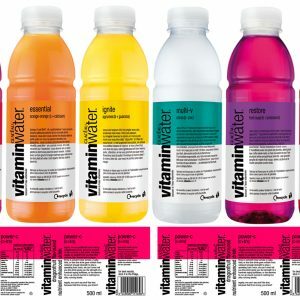 According to the manufacturer, most flavors of Vitamin Water are fortified with vitamin C and essential B vitamins. Some formulas also contain vitamin A, calcium, vitamin E, zinc, magnesium, potassium, chromium, or manganese. The formula of the Energy Vitamin Water also contains caffeine for that added energy boost. There are many available flavors of Vitamin Water. According to the brand’s website, below are the names and flavors of each drink. It should be noted that aside from the flavors, each bottle may also contain other natural flavors and added sweeteners. Tropical mango flavor with the following ingredients: reverse osmosis water, crystalline fructose, cane sugar, less than .5% of citric acid, potassium phosphate and calcium lactate and magnesium lactate, vitamins C, E, B3, B5, B6, B12, lycopene, and carotenal. Vital-T. Iced tea flavor with the following ingredients: reverse osmosis water, crystalline fructose, cane sugar, less than 1% of tea powder, citric acid, natural flavors, vitamin C, potassium phosphate and calcium lactate and magnesium lactate, vitamins E, B5, B6, and B12. Power-C. Dragonfruit flavor with the following ingredients: reverse osmosis water, crystalline fructose, cane sugar, less than .5% of vitamin C, citric acid, natural flavors, dragonfruit extract, vegetable juice, magnesium lactate and calcium lactate and potassium phosphate, taurine, vitamin B5, zinc gluconate, vitamins B6 and B12, chromium polynicotinate. Kiwi and strawberry flavor with the following ingredients: reverse osmosis water, crystalline fructose, cane sugar, less than .5% of vitamin C, citric acid, natural flavors, vegetable juice, gum acacia, magnesium lactate and calcium lactate and potassium phosphate, vitamin B5, ester of rosin, vitamin A, palmitate, vitamins B6 and B12. Orange and orange flavor with the following ingredients: reverse osmosis water, crystalline fructose, cane sugar, less than .5% of citric acid, potassium phosphate and calcium lactate and magnesium lactate, natural flavors, vitamin C, gum acacia, vitamins B3, E, B5, glycerol ester of rosin, vitamins B6, B12, beta carotene, modified food starch, sorbitol. Tropical citrus flavor with the following ingredients: reverse osmosis water, crystalline fructose, cane sugar, less than .5% of natural flavors, vitamin C, citric acid, gum acacia, magnesium lactate and calcium lactate and potassium phosphate, caffeine, vitamin B3, glycerol ester of rosin, guarana seed extract, vitamins B5 and B6, beta carotene, and vitamin B12. Lemonade flavor with the following ingredients: reverse osmosis water, crystalline fructose, cane sugar, less than .5% of citric acid, calcium lactate gluconate and magnesium chloride and calcium lactate and magnesium lactate and potassium phosphate, natural flavors, vitamin C, gum acacia, vitamins E and B5, glycerol ester of rosin, zinc gluconate, vitamin A, palmitate, vitamin B6. Fruit punch flavor with the following ingredients: reverse osmosis water, crystalline fructose, cane sugar, less than 1% of mono-potassium phosphate and di-potassium phosphate and magnesium lactate and calcium lactate, natural flavors, citric acid, vitamin C, fruit and vegetable juice, vitamins B3 and B5, gum acacia, glycerol ester of rosin, vitamins B6 and B12. Acai, blueberry, and pomegranate flavor with the following ingredients: reverse osmosis water, crystalline fructose, cane sugar, less than .5% of citric acid, vitamin C, fruit and vegetable juice, natural flavors, berry and fruit extracts, magnesium lactate and calcium lactate and potassium phosphate, vitamins B3 and B5, beta carotene, vitamins B6 and B12, manganese citrate, gum acacia. Acai, blueberry, and pomegranate flavor.